Eric Eaton: Eric has performed all over the United States. Some cities would include Las Vegas, Hollywood, Phoenix, Chicago, Denver, Dallas, St. Louis, New Orleans, Sarasota, Hilton Head Island and many more. Eric is a member of the International Brotherhood of Magicians and at age 15 was invited to the Magic Castle in Hollywood, California. Eric has been asked to perform at two comic con type events. Eric has also done a lot of work with celebrities some which would include Steve Byrne, Lou Ferrigno, Desiigner, Jay Pharoah, Emo Philips, and many more in which you can find on his social media platforms; @themagicofericeaton. 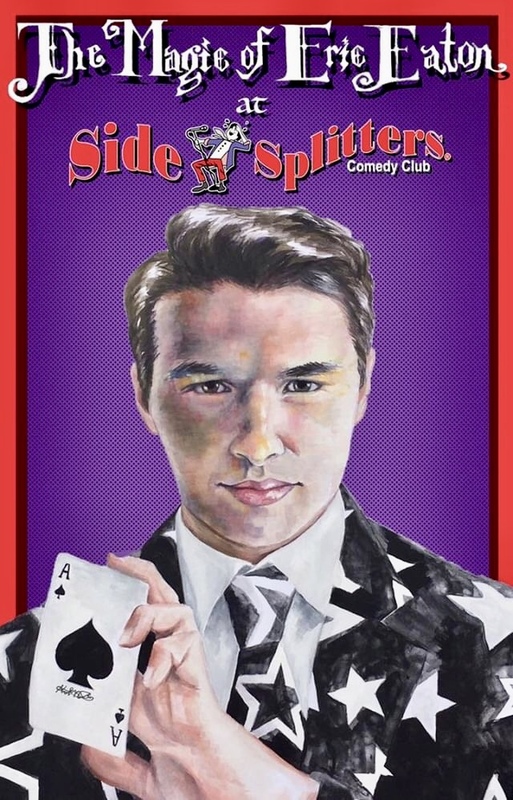 Eric puts on a great show that earns him high praise and ovations as well, with his unique blend of magic, charm and comedic wit, having one reviewer referring to his amazing comedic tendencies and his devilish good looks to being the perfect combination for a compelling and entertaining show. All of Eric’s tricks include audience members. From the show’s start to the incredible finish, audience members find themselves on stage trading barbs with Eric and having the time of their lives! The interchange is classic entertainment at its best. Don’t miss your chance to see Eric live!